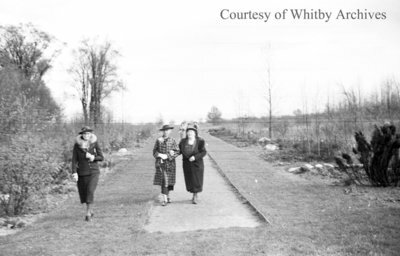 A black and white negative of three unidentified women walking along a path at the Guild Inn on May 12, 1938. The women were participating in the Guild of All Arts Alumnae tea held at the Inn. The Guild Inn was located in Scarborough, Ontario. The proprietors, Rosa and Spencer Clark, formed the Guild of All Arts at the Inn. In return for room and board artists would share their art and knowledge with the Guild and its visitors (Miedema, Gary. The Guild Inn. heritagetoronto.org/the-guild-inn/, August 5, 2014). Guild of All Arts Alumnae Tea, May 12, 1938, Marjorie Ruddy. Whitby Archives A2013_040_653C.